"Life is like sailing - prepare for the lulls, enjoy the puffs." Happy New Year. Enjoy the puffs in 2007. I set myself a goal: finish in the top half of my age-group fleet in the Laser Masters Worlds in Cascais, Portugal in July next year (2007). Then the class association threw a spanner in the works by announcing in October that they had been unable to agree with the proposed hosts to hold the Masters Worlds in Cascais. During the last few weeks three other potential sites in Europe have been evaluated and yesterday it was announced that the regatta will be in Roses, Spain at the end of September. Roses is an essentially Mediterranean town with a notable tourist and seafaring tradition. It is situated in a unique natural setting, at the north of the Costa Brava, less than 30 kilometres from the frontier with France, 65 kilometres from Girona and 160 kilometres from Barcelona. Apparently we can expect an interesting variety of wind conditions with nothing too strenuous for us old geezers. Sounds good to me. Not too far from where I was sailing in Menorca in 2006 at exactly the same time of year. Hmmm -- maybe I could go early and tune up for a week or two at Minorca Sailing? We haven't visited that corner of mainland Spain before and Tillerwoman is already talking about art galleries in Barcelona. Sounds like we might be in Spain for several weeks. Hey, it's a tough job but somebody has got to do it. Why do I run? Why do I sail? Why do I blog? Well, part of the answer is related to the inherent rewards in each of these activities. But another part is that I am also hoping, vainly perhaps, that these pursuits will hold off the threat of a decline in mental and physical powers as I age. What to do? After a while (and a few false starts -- geeze there are some seriously good backgammon players on Yahoo!) I developed the notion that I should participate in a range of activities that would challenge both mind and body, in the hope of staving off the aging process for as long as possible. A kind of Use It Or Lose It philosophy. As the years go by the occasional "senior moment" is a check on how well this strategy is succeeding -- or not. That phrase is usually used to describe the lapses in memory experienced by older folk, of the kind celebrated in these jokes from Dull Men's Club. But, as you will see, I use the phrase in a broader sense: those moments, good and bad, that give me a checkpoint on how the Use It Or Lose It plan is working. Here are five of my senior moments from the last couple of weeks. 1. Going to the ATM and forgetting my PIN number. What a shocker! I go and get cash from the bank every couple of weeks or so. And I've had the same PIN number for at least a decade. But last time I went to the cash machine and it asked me for my number... Ummm. Well, I know some of the digits. What are the other two? One-zero? Let's see. No, it doesn't like that. Zero-zero? Wrong again. Hmmm. Wonder how many tries I get before this thing eats my card? So I went home cashless. Next day I tried again and the number came straight back to me. Weird. Have I lost it? Will someone half my age please leave a comment and say this thing has happened to them too? Please? 2. Running a fast 5k. The marathon training has been going well. Ten weeks (out of twenty six) under my belt now and I haven't missed a single workout. Every two or three weeks the program calls for me to run a fast 5k. The time achieved is used to estimate my target time for the marathon based on a table in Jeff Galloway's book. I ran a 5k early last week and was surprised to discover that it was the fastest time I had run this distance for five years. OK -- nothing like as fast as my personal best that I ran in the distant days of my comparative youth in my early forties. But even so it's good to know that in at least one aspect of my life I'm not declining into early senility. 3. Better Tacks. Later in the week I broke the ice on the edge of my local lake and went for a sail in my Laser. It was one of those rare days when the wind was in the perfect direction from the south, down the long axis of the lake, meaning that the usual huge shifts and wind holes and slam dunk gusts weren't quite as bad as they are every other day. A solid 10-12 knots. Gorgeous sunny day with blue sky. I worked on gybes and tacks and windward mark roundings and leeward mark roundings. Especially with my tacks I felt I was really making progress, applying some of the tips I picked up from my instructor in Menorca, tacking better in these conditions than I ever had before. I can still improve. 4. Not getting lost. This week my marathon program included a nine mile run. Relatively easy after the sixteen mile run last week. Afterwards I looked back in my 2005 running diary as I couldn't remember where I had done the same week's long run last year. Ahah. That was the infamous senior moment when I got myself lost in the woods that I wrote about in Sense of Direction. Oh well, be thankful for small mercies. Some times just not getting lost is a sign of progress. 5.....................? I'm sure there was another senior moment I was planning to tell you about, but for the life of me I can't remember it. Perhaps it will come back to me tomorrow? Does this make six? The last couple of days I've been trying out Tacticat. My reaction as a beginner in the Laser races is very similar to that of Tim Coleman. I still haven't mastered the crowded starts and mark roundings but it is kind of addictive. Fellow blogging Laser sailor (and Tillerman sprog) Litoralis spent most of Christmas sitting in my favorite chair playing the game obsessively and thereby kindly allowing Tillerwoman and myself uninterrupted time to play with his daughter, Cutest Granddaughter in the World. Tacticat can't compete with her as a source of amusement (at least not for me) but it's OK now she's gone home. I see Litoralis is now ranked 4th out of 518 competitors and is the British National Tacticat Champion. Tim is doing pretty well too and is ranked in the Top 100. I'm still not sure if Tacticat provides the kind of practice that will improve actual racing performance in the real world. It certainly gives you the opportunity to try out different approaches in various tactical situations, but to the extent that it can never be a perfect simulation of real sailing I wonder if it might teach some incorrect techniques too. We will see. But who cares? Tacticat are offering a Velocitek S-10 GPS Speedometer to the winner of their Christmas Regatta. Now that beats any prize I have ever won at real sailing. So perhaps the better question is whether real sailing talent translates to success in the virtual world? 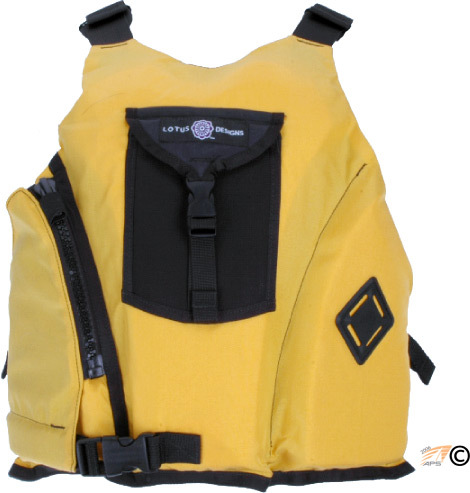 One son bought me the new Laser clew sleeve and hook for Xmas and the other one gave me a new yellow Lotus Lola PFD (and it was even the right size). It was just what I wanted. How did they know? They must be telepathic. Can't wait to get out on the water and try both my new toys. A few days I go I posted an email from Mark Hammett explaining the background to the infamous Ham-It-Up video of his crew on a Capri 25 making a few mistakes and learning from them. Comments here and elsewhere to his email have been largely favorable; folk seem to appreciate his integrity and courage in making this training video and letting the world see it, however embarrassing it might be and however mean-spirited some of the criticism was. So who is the Daddy of sailing blogs? Who started the first sailing blog? Who wrote the first blog post about sailing? It's hard to know for sure. Weblogs have been around since 1998. Some blogs may have been abandoned or been deleted. Some bloggers may have deleted their earlier archives or changed platforms and not transferred archives. And the only way I can think of to research this question is to look back in the archives of currently active blogs. So with those reservations what can we discover? Some of the sailing blogs that were around in the early days when I were blogging such as EVK4 Bloglet and Zephyr have sailing stories in their archives dating back to early 2005. Are there any earlier sailing blogs? Ahah. Sherry Fowler's Stay of Execution, though by no means a blog purely about sailing, has sailing stories dating back to September 2003. Ah, but Ant Clay at Soulsailor goes back even further with a post from May 2003 about boat names which told the world that the Enterprise owned by his crew was named Sofa King Lazy. (Say it quickly -- unless there are kids about in which case don't say it at all.) So is Ant the Grand Daddy of all sailing bloggers? Not so fast. There's someone who has been blogging about sailing for even longer than Ant. Yeah, Rohan Veal has been blogging about sailing since January 2003. The oldest entry in his archives is a link to an account of how he won the 51st Australian Moth Championships. It dates from 13 January 2003. And Rohan is still blogging about Moth sailing and promoting sales of the Bladerider for KA Sail around the world. So can anyone beat that? Or is Rohan the Daddy of All Sailing Bloggers? Now I see that one of the big guns of sailing writing is copying my act. Esteemed old-media dead-tree glossy magazine Sailing World has started a blog and SW editor Dave Reed has written the first post in that blog about... what else but his pathetic attempts to race a Laser in a frostbite series. Of course he writes a lot better than I do but, if his post is to be believed, he sails just as badly as me. Dave, welcome to my world. What took you so long? 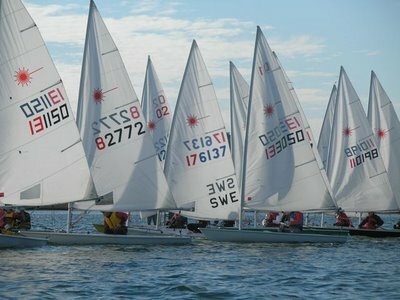 Winter was almost over when the Laser frostbite sailing at the club in Connecticut started in March and I went racing my Laser one day in Rain, and on another day in 25 knots that required some Changes in Attitudes. 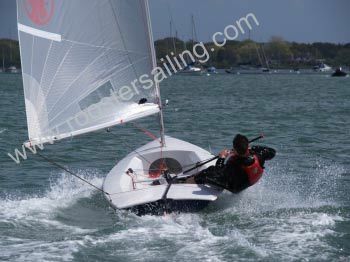 Spring arrived in April and my Laser racing continued with a photogenic start shown at 5-4-3-2-1-GO!! !, another day when I really needed some excuses, and an awesome day of sailing in the rain, (again). In May the Wednesday night Sunfish racing started at my local reservoir club in New Jersey and I found myself waxing poetic about the reasons I sail in Memories of a Moment. At the end of the month I had the pleasure of sailing a Laser regatta with my son again, the first time we had done this together for many years, when he beat me in the Second Annual Collander Cup. The light winds of summer lake sailing had me musing about Learning to Love Light Air and then on Father's Day I took revenge on my son by beating him in Laser Sailing at Lake Whippersnapper. I only sailed one major regatta in 2006 and that was the Newport Regatta in July. The experience inspired me to write Top Ten Random Memories and even to compose a song, The Ballad of Tillerman - Oh No! In August I watched my son sailing with Sunfish Fleet 17 and got frustrated at my own incompetence at Sunfish sailing in Wednesday Night Racing, so badly in fact that I went out and Sold my Sunfish. After a couple of weeks with no sailing in September I rediscovered how much I enjoy Laser sailing in Relapse and then at the end of the month Tillerwoman and I headed off for a vacation at Minorca Sailing. It was a long time since our previous visit but we discovered that very little had changed at Minorca Sailing - 25 Years Later. I sailed Lasers, learned how to sail a single-hander with a spinnaker, tried my hand at windsurfing, and wrote all about it in More on Minorca Sailing. Those two weeks were definitely the most enjoyable sailing experience of the year. When we returned to the US, the Laser frostbite season had already started. I did my race committee duty and learned a lot by Watching Boats. I rediscovered why I love racing Laser so much even when I do badly in The Pessimist and the Optimist, and made something of a breakthrough in Snap! This post has been submitted to the ProBlogger Group Writing Project - Reviews and Predictions. The end of the year is nigh and possibly Proper Course - the literal "Granddaddy" of sailing bloggers - is readying his list of the 2006 top ten sailing blogs. He goes on to point out that there are a lot more sailing blogs now than there were a year ago when I published my first Top Ten Sailing Blogs list. How right he is. A year ago the Top Ten was very easy to pick; there were only around ten or so top quality, interesting, entertaining blogs about sailing that were being regularly updated. Now we will actually have to make some hard choices to narrow the list down to the top ten. But "Granddaddy" accepts the challenge, on the condition that you help me this year. I would like some major input from other sailing bloggers and sailing blog readers as to which blogs are worthy of consideration and which ones should make the final cut. It is mainly about sailing. It has been in existence for most of 2006. It is updated regularly - say at least once a week for most of the year. It is actually worth reading... it's interesting, entertaining, educational, funny, spectacular, whatever... something grabs you about it. I'm wondering whether another qualification should be that the writer engages his or her audience, allows comments on the blog, responds to them, makes comments on other sailing blogs, is part of the community. Not sure whether this is essential or not. What do you think? A good place to start the list of potential candidates for the top ten would be the three top ten lists I have already published. So please check out Top Ten Sailing Blogs of 2005, Boating Blog Roundup and More Sailing Blogs. Browse through my blogroll of Boating Blogs on the right. Are there any other sailing blogs you enjoy that are not on these lists? Then please leave me a comment telling me which sailing blogs you think should make the 2006 Top Ten List. Still not sure what to buy the favorite dinghy sailor in your life for Xmas? Have you looked at his or her PFD lately? Is it showing signs of fading and wear? Is the zipper broken? 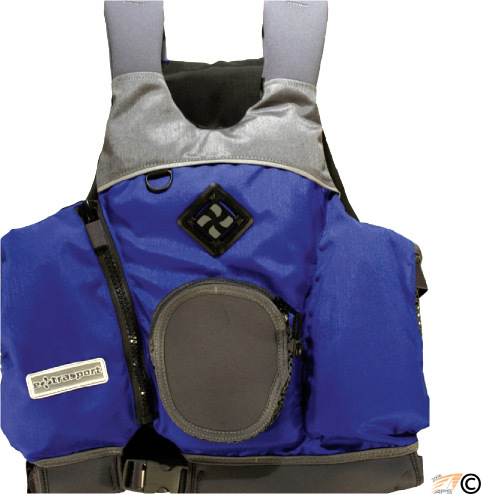 If so, show you care by buying your dinghy sailor the gift that might save his or her life some day, a new PFD. Personally I prefer the type with a side zip and a front pocket. Two PFDs that seem to get good reviews and are extremely popular on the dinghy racing scene are the Lola by Lotus (yellow one on the left below) and the Retroglide Avenger by Extrasport (blue on the right). If your dinghy sailor happens to be 6'2" tall and around 182 lbs then the Large size should be a good fit for him (or her). Frankie from Threefold Twenty kicks off the tales about who inspired us to take up sailing with a post entitled Sailing Lust in which she ponders where she picked up the lust to be out on the ocean, and concludes that the original inspiration came from two books she read when she was 16 or 17, Jules Verne's 'Les enfants du capitaine Grant' and Bernard Moitessier's 'Vagabond des mers du sud'. Edward from EVK4 Bloglet tells us in Inspiration that sailing with his father was his introduction to the sport. Trips with Dad including sailing a 72 foot yawl in the Caribbean, and an Atlantic crossing which Edward says "still ranks simultaneously as the most boring and most exhilarating sailing experience of my life". Og from LiveSailDie fancifully traces the start of her love for sailing back to her mother's womb and her prenatal crewing experiences on a Hobie 16, but realistically gives more credit to what her parents did to introduce her to the sport after she was born and the influence of Andrew Landenberger, a former Moth World champion and Olympic silver medalist, and his father. Pat from Desert Sea has three stories for us describing his early encounters with boats. First boats with heavy cross starts with young Pat at 9 years old sitting on his regular stool in the Tradewinds Bar and ends with him as a 13 year old altar boy on the heaving deck of a cutter wearing red robes and swinging a heavy brass cross around. (It's not clear to me whether it was the Tradewinds Bar or the Episcopal Church that was his major inspiration.) Not Quite the Making of a Sailor tells us of Pat's adventures as not quite a sailor at the Rice University Sailing Club including a scary sailing adventure with a kindly old gentleman who was "literally shorthanded". The final act in this trilogy about how Pat becomes a sailor in spite of his earlier setbacks, How we got our boat, reveals how he was inspired to buy a boat in the desert when a salesperson was trying to sell him a condo timeshare. Must win the prize for the most unlikely source of inspiration! Zen from Zensekai tells us that his Inspiration to take up sailing came from Wild Rose, Captn Ron, and a boat that used to belong to Jayne Mansfield. Thanks to Zen for giving me the first opportunity to post a photo on Proper Course of a former Playmate of the Month. Geeze, did women really have curves like that back in the 1950's? Where was I? Oh yes. Inspiration. I wrote yesterday in Men from Mars about two sailors that influenced me to take up the sport. Pretty mundane tale really compared to some of the above. So there we have it. Parents. Famous sailors. Famous authors. An in-the-womb experience. The Episcopal Church. A guy short of hands. Captn Ron. A Playmate of the Month. Wild Rose. A timeshare salesperson. All people that inspired us to take up sailing. Thanks to all of the writers who responded to my request for stories on their sources of inspiration. You guys are the best. Update 20 Dec 2006: Manfred from Germany has also written of his source of inspiration in How it all began. Update 22 Dec 2006: Ant Clay from England tells us how caravans were the reason his father and he started sailing. Pat, in a comment on yesterday's post about the famous Ham-it-Up video, wondered how Mark Hammett managed to get such excellent footage of his crew in action. According to the note with the video on YouTube, the answer is the Horizon True Video Camera Mount. Looks pretty cool. Would make a great Xmas present for a skipper from his crew, methinks. Just a suggestion. Shame it wouldn't fit on a Laser! A few weeks ago I discussed in Worth Doing Badly a video in which the crew of a Capri 25 got themselves in all sorts of difficulties. Among other observations I speculated on the motivations of Mark Hammett, the skipper of the Capri 25, in allowing the world to see this somewhat embarrassing video of his crew in action. I hope I wasn't too hard on him and his crew; they certainly endured a lot worse treatment from other writers on a certain sailing forum and elsewhere. I want to thank you for the kind words your blog expresses on the desire to sail even if it is done badly. You must appreciate that I have had a long career sailing as the foredeck on many boats ranging from 20-70 feet in length and in several venues in the North American continent for thirty+ years. This is includes being a mast-man on the winning Tatiana crew on the 1989 J-35 National Championships in Long Beach, Ca. I love to sail every moment I can, whether racing, practicing, cruising, and always with the belief and attitude that everyday is race-day! I purchased my Capri-25 four years ago, my first time as an owner. I have worked my boat with one mission – training the future sailors and skippers who will replace the current guard in my beloved sport. I have reached the age of 50 years now and know that my limits will only allow me the occasional long distance race and I am resigned to the fact that club racing will be center of the rest of my sailing career. So here is where I know I will do the most good for my sport. The young boy that was on my boat that day was his first real ride on a racing boat under these extreme conditions. He has since spent the summer in sailing camps and at 12 will return to my boat to race everyday he can… Goal accomplished! Since I posted the video on YouTube in November, I have endured all the negative comments from the armchair snipers who probably lack the experience or the courage to lead a young or lesser experienced group of sailors into any event, let also a National Championship; willing to take what God and the elements hand us at any given minute. They likely would stand on shore pouting they could not find a group of rock-stars, while I go out with my journeymen crew and take on the Goliaths on the race course. Like a pilot before flying, I daily and regularly ask the crew if the conditions feel to be beyond their experience or willingness to compete. On this day, one race finished, and in the second race, the thirty minutes before the broach, we had already completed four legs in building conditions including a downwind leg in which a hand held GPS indicated a sustained boat speeds of over 10 knots for almost 3 minutes (not quite the planning speed – but very close). And the video from that leg showed everything (crew and boat) in perfect working order. Those who rip the boat on its performance, lack the skills to really take a large-small boat that acts like a dingy but sleeps four comfortably, and yes, it is not a J-22, or J-24, or Melges, or Scow, or anything fancy, or expensive to sail out of the box, and the snooty crews and skippers that sail them. It is a family racer/cruiser, it’s cheap to race, it’s easy sail, and very forgiving, period. That is why my daughter has been its helmsmen for the last four years (who has helmed in three national championships from age 14 and this year at 16). I would challenge all of those who bad mouth this boat, the fleet, or my sailing skills to come to Lake Minnetonka and race against me single-handing a Capri-25 with spinnakers and then brag to me and world how great they are at sailing. This year as school and other commitments took my crew from me for four different races, I sailed single-handed and never finished DFL. In fact in some of the series finishes, I did better than with my crew on board. The edited video was shared first with my own home yacht club’s annual awards banquet in celebration of the courage (and yes sometimes a fool-heartiness) of my crew and myself as the skipper of the Capri-25 and the foibles of my competitors. But also to remind everyone there, we are always learning and experiencing the ways to handle a machine that is totally dependent on all the energies of nature and efforts of the operators and its moving parts to all work together; and that any one or the other these gets out of balance, that events will lead to the disaster that whole world has now witnessed. At this annual event we celebrate all the best that sailing is and isn’t, because we all know the difference from first to last is the number of mistakes you don’t make. The notion that this is a self-deprecating video meant to make fun of myself or my crew is farthest from the intention. It a learning video prepared with some style. Just look at the time stamp. 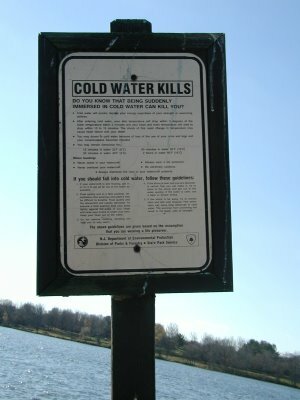 The only cut in the action was after we got under control and the final collection of our crewmen that went overboard. · Is it humorous; absolutely. · Were we lucky that no one was injured in the boom-cross; definitely. · Was the MOB in danger of hyperthermia – No … Lake Minnetonka is a shallow lake and in June is like a lukewarm bath at 70°; you’d have to be in the water two-three hours before you start getting stiff and cold. · Did we make mistakes – That’s the reason I video every race and practice; so that we can review everything – both the good and the bad and that means learning from bad on what not to do and model the good. I can take a raw novice crew in one to two months of practice on weekends now with the video to review and work through most of the issues of bad techniques that start and head them off early from bad habits. Show me an NFL team that doesn’t review their game play video and I’ll show you a team with a losing record. · Is it a good example of what-not-to-do? You bet… I’ve looked for video training tapes for years on keel boats having a knock-down as bad as this one, so that I can prepare and train my crew for them. Not even the famous J-24 training videos even deal with showing how to deal with such events because the producers fear law suits, broken equipment, etc in the making of such raw events…Never have they used extreme condition to video crew work and the forces of nature. Well, now I have one. If someone wants a copy of the original unedited version for a training video I would consider selling a copy with proceeds for the crew on my boat and for our sailing program. On training days, you can’t manufacture winds or conditions like this to practice these high risk maneuvers. Many owners resist putting their equipment in peril just to practice a round-down or extreme-round-up. Too many things can break. I do take my team out to practice the round-ups and they handle them very well. Round-downs are rare. But in this incident you have to look at the start of the event being the halyard not being topped causing the masthead to gyrate back and forth. The mistake that led to the round-down was not using a winch to top it out and as the halyard eased out, the more out of balance the boat became making it difficult for Corry to predict the stall of the rudder which occurred moments later. · Do have pride in my crew – Beyond all; it’s more than pride, its respect! Through the whole event not a single word of abuse or foul language was uttered or spoken aloud by anyone at anyone else on board. And there was no panic. 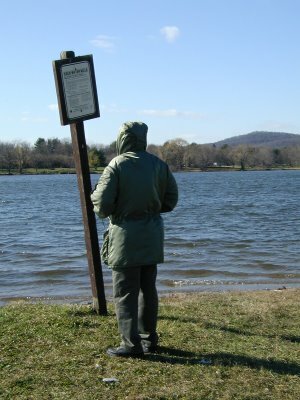 Instead, following directions and communicating, the recovery began and finished without breakage, serious injury, and only wet clothes and an experience the crew will always remember. When training my crew, that’s the first rule; watch thy tongue. In an emergency the messages do not translate when mixed in foul language. The blame is never leveled at the crew, the equipment, or another boat or competitor, it is the skipper who takes all responsibility for the actions of the boat. I remove those from my midst that abuse others though thoughtless words and uncontrolled emotions. In that my crew has my respect and I know they respect me and all of them will sail with me anywhere at anytime. Now I have shared some of my thoughts with you on the why and how what happened and what lead me to share this humbling experience with the world. It was never vanity or fame I sought in sharing, just the love of the sport I live everyday and strive to do better in every practice, cruise, or race. And to help improve those I don’t come in contact with. I’ve already heard from friends on both coasts, that they are using this video as a training aid, and it has only been out for a month. What will happen in a year… who knows… I just hope and pray it will save lives and boats in the future. Add this to your blog if you wish – I’ll act as Shakespeare’s Shylock, and wither the slings and arrows of the armchair skippers out there. I asked readers to write posts in their blogs about the people who inspired them to take up sailing. Speaking for myself, I grew up in a place and a time -- a working class neighborhood in England in the 1950s -- where sailing was just not one of those things that you even imagined you could do. It would have been less bizarre to express an ambition to move to Mars than to say I had a yen to take up some supposedly elitist sport like sailing. But I always had this strange idea that messing about in boats would be fun. Then when I was in my twenties I was lucky enough to work (at the IT department of a major multi-national) with two young men who were, at the time, among the best small boat sailors in the British Isles: Philip Crebbin and David Wilkins. They both had Olympic ambitions and I used to enjoy hearing their tales of weekends spent at various sailing competitions. I think the HR manager who handled university recruiting in the year Phil and Dave were hired must have been a sailor himself and was working on the theory that the ability to waggle a tiller and steer a boat round the buoys fast had some correlation with the skills necessary to be a future captain of industry. Who knows? He may have been right. Makes more sense than some of the tests used by recruiters these days. Phil was dominant on the British dinghy scene at that time and twice won the Endeavour Trophy, the British Champion of Champions event. He also won the 470 World Cup in 1976. Phil and Dave both sailed in the 1976 Olympics, Dave in the Tempest for Ireland and Phil in the 470 for Great Britain, but neither came home with a medal. 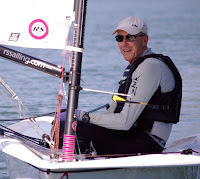 Phil left the company in the late 1970's to focus on his sailing career full-time and was successful in being selected to sail the Soling on the British team in the 1980 Olympics. Of course Margaret Thatcher had different ideas and somehow got the weird notion that stopping British sailors from competing in Estonia would somehow persuade the Soviet Union to withdraw its troops from Afghanistan. Much to her surprise, Leonard Brezhnev was not impressed with the Iron Lady's gesture. The Irish government, perhaps having a more realistic view of its ability to influence the old man in the Kremlin, allowed their Olympic athletes to attend the 1980 Games and my friend David Wilkins won the silver medal in the Flying Dutchman class. Phil Crebbin went on to play a leading role in some of the America's Cup challenges by Great Britain in the 1980's, as skipper in 1983 and technical director in 1987. He won the Admiral's Cup, and the 8 Metre World Championship six times. He is now one of the principals in Race1, a Grand Prix Racing charter company. Dave went on to sail in other Olympic Games and also played an active role in the development of the club at which we both sailed in the 1980's, Rutland Sailing Club. I came to know him better after I moved to Rutland around 1985 as, at that time, he was the driving force behind the club's junior program. Both my sons learned to sail in that program and Dave sold us our first Optimist. We lost touch after I moved to America in 1988 but I met him again purely by chance at the Laser Masters Worlds in Cadiz in 2003 where he was doing some coaching. I see he is still sailing a Laser himself, winning the Rutland Sailing Club Laser Championship a few weeks ago. Looking back, I think it was working with these young men and seeing their enthusiasm and commitment to racing that gave me the urge to learn to sail, buy a boat, and get into the racing scene myself a few years later. But it was the members of the Laser fleet at my first sailing club who really inspired in me a life-long passion for the sport. They passed on to me their sense of fun and enthusiasm for the Laser; they taught me tactics by pulling moves on me on the racecourse and then explaining to me afterwards how I should have countered them; they taught me respect for the rules by winning protests against me but always treating me in a friendly and sportsmanlike manner; they encouraged me to travel and to compete with them at other local clubs; they showed me that ice and snow are no reasons to stop sailing in the winter. And every other place I have sailed since then I have found Laser sailors just as welcoming, just as helpful... and just as competitive. Thanks to all of you. OK OK. I know it's a long time to the Olympics. But just for fun, let's check out which nations and which sailors are currently at the top of the rankings published by the International Sailing Federation. No surprise to see who continues to be the #1 nation at Olympic sailing. Great Britain leads the pack with seven teams in a top three position; and of the eleven Olympic sailing disciplines, Great Britain leads the rankings in three of them: Paul Goodison (Laser), Christina Bassadone and Saskia Clark (Women's 470), and Nick Dempsey (Men's RS:X). Only one American is top of the rankings in an Olympic class. Can you guess who? 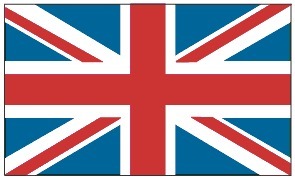 Answer at the bottom of the page after entirely merited patriotic song in support of Great Britain's Olympic sailors. Answer to quiz: Anna Tunnicliffe (USA) is ranked #1 in the Laser Radial Women's One Person Dinghy. But she was born in England. How many companies in the sailing industry really understand how to use the web to promote their brands, market their products, and grow their businesses? Oh yeah. They all have websites. Gee - how twentieth century. But do they excite the unwashed masses who are their potential customers? Do they exploit the power of existing social networks on the Internet? Do they take advantage of the existing resources in forums, blogs, news sites, etc. to get out the word about their products? Has any company in the sailing industry successfully used viral marketing to start a wildfire of demand for their boats, sails, services, gadgets or whatever? 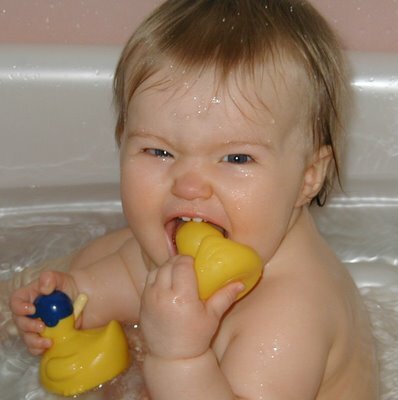 You think this crazy kid will like the water? On recent Sundays, there have been over 120 people RACING LASERS at either Cedar Point in Westport, CT (one hour from NYC) or Newport. The CPYC and Newport programs keep leapfrogging each other for turnout, but both programs show the health and GROWTH of Laser racing at the local level. How right he is, but the phenomenon of growth in single-handed frostbite racing is happening in other classes as well as Lasers and is to be found all over New England. And according to the New England (District 7) Laser Class website these frostbite fleets are just the tip of the iceberg (pun intended) with cold season Laser activity also in Marion Massachusetts and Essex Connecticut. Then in Barrington Rhode Island we have the Barrington Yacht Club Sunfish Frostbite Fleet who seem to have 15 to 20 boats out most weekends. Hmm, let's see, that's Connecticut, Rhode Island, Massachusetts and New Hampshire. I'm not aware of any frostbite racing in the other two New England states Maine and Vermont. Maybe I haven't looked hard enough or maybe those guys are enjoying the great skiing in their states? So what's responsible for this craze for spending several hours every Sunday afternoon racing a small boat in icy conditions? Is it just the opportunity to extend the sailing season, even in one of the coldest regions of the country, to 9, 10 or even 12 months of the year? Is it the simplicity of single-handed sailing -- no need to line up crew, just show up and sail? Is it the wish of racing sailors, many from other classes, to keep their racing skills sharp in the winter? Probably all of the above. Plus the enthusiasm and passion of some key individuals responsible for the growth of these fleets, coupled with their creative, not to say persistent, use of emails, forums, sailing club websites, yes and even blogs, to publicize their activities. One idea that some of these fleets use to encourage fleet members and to raise standards all round is to publish Words of Wisdom each week, usually written by the week's winner, to explain to the rest of the fleet how he or she pulled it off and to pass on tips to less experienced sailors. In the meantime, enjoy this video of Laser Fleet 413 in action in Newport last weekend. Konnichiwa to all the Japanese readers of Proper Course. For reasons I haven't really figured out, this blog has suddenly become popular in Japan. Indeed in the last 24 hours or so there have been more hits from Japan than from any other country. It looks to me as if a link to Proper Course has been circulating by email in Japan. 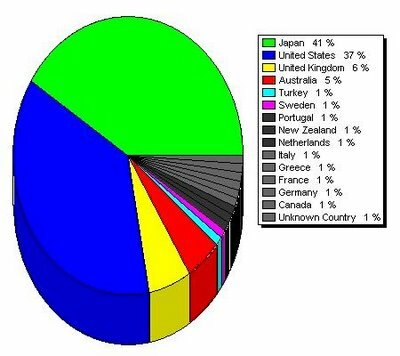 I wonder who these Japanese sailing blog readers are. Please leave a comment and say hi if you are one of them and tell me how you heard about Proper Course. For those of you who enjoy virtual sailboat racing, as opposed to the real thing, do try out Tacticat an internet simulator of tactical racing around the buoys. My initial impression is that Tacticat has less broccoli and more heroin than Second Life. You have been warned. 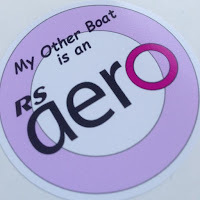 Check out One Year Later ... an account by Carol Anne of Five O'Clock Somewhere of her transition during the last year from "a cruising sailor with a MacGregor 26, middle aged, dumpy" (her description not mine) to an avid racer, Etchells owner and Adams Cup competitor. She credits this blog as at least partly responsible for her new approach to sailing -- "Tillerman, it's all your fault" -- but if you read the full story you will discover that her inspiration really comes from the support of some wonderful sailing friends, the backing of an amazingly generous husband (a racing keelboat as a gift for Valentine's Day Pat? What were you thinking? How are we other husbands supposed to match that?) and the special charms of her Etchells, "the sexiest boat on the lake". Carol Anne's post set me to thinking. Who inspired me to take up sailing? And for those of you reading this post (most of whom are boaters of some kind, I suspect) who inspired you to take up the sport or to follow your current direction in boating? It might be a parent or other role model, a friend, a famous sailor, a writer, maybe even a fictional character. So I thought it might be fun to develop a composite post with links to stories about all the folk who have inspired others to take up sailing or other watery sports. Please help me to achieve this by writing a post on your blog about the person that inspired you (with or without their real name -- it's up to you) and send me an email at tillermeister@gmail.com telling me where to find your story. A week from now, on or around Monday 18 December, I will write a post with links to all the stories you send me and then we can all compare the diverse sources of our inspirations to take up water sports. Everybody loves Laser sailors, right? You know them. They are the tall, sun-tanned, super-fit, handsome, most helpful and friendliest guys at your yacht club. Even those yahoos at Sailing Anarchy love us. Not! Oh well, if that's not entirely true than everyone who reads this blog loves one particular Laser sailor, right? Your son, daughter, husband, wife, father, mother, girlfriend, boyfriend, whatever. At least one of them must be a Laser sailor. There are a lot of us. So what are you going to buy your Laser sailor this holiday season? Here is one suggestion that he or she is sure to appreciate. Laser Clew Sleeve and Hook. Only recently approved for use on the Laser (after the 1 December 2006 amendment to the Laser Class Rules), the Laser Clew Sleeve is an all-in-one solution to rigging the outhaul and clew tie-down. 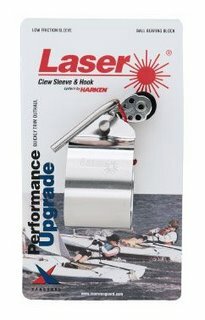 Produced by Harken, a combination of low friction metal sleeving and a ball bearing block facilitates easy outhaul adjustment, especially in light air. Extensive development went into this particular design, and the hook is designed to not allow unwanted release of the sail while still allowing quick release during rigging and derigging. The makers claim that, even though it is a metal sleeve riding up and down a metal boom, it should not produce any noticeable wear on the surface of the boom. It's brand new. Every Laser sailor will want one. Makes the perfect gift. Available in the USA from APS and other dealers. Whenever I try and take a still photo of the sea in strong wind, what my eye sees as scary monster waves with breaking foaming crests always come out in the photo as a few scattered wimpy pathetic ripples. So when I see a photo like the one above I know that it was wicked weather for small sailboat racing. 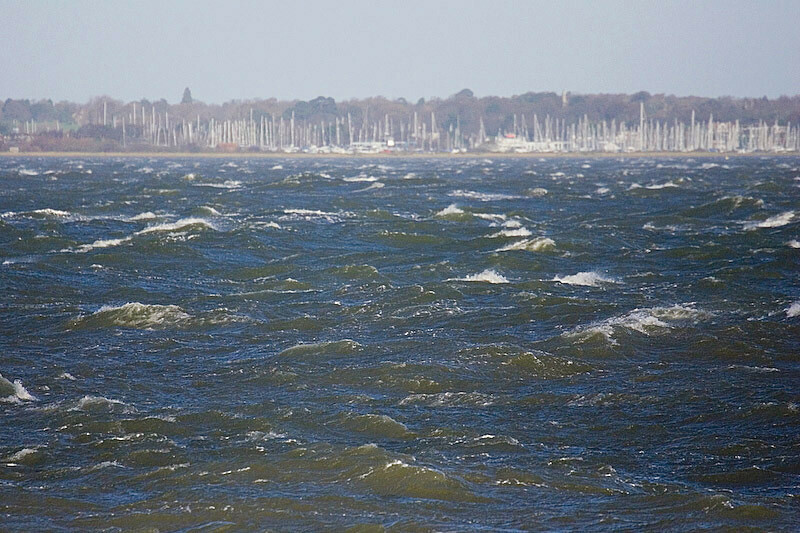 Thanks to Yachts and Yachting for the photo accompanying an article about why the final weekend of the Garmin Hamble Winter Series 2006 was abandoned. Reluctantly, the race officers were forced to decide on abandonment, and the wisdom of their decision was seen when the wind peaked at more than 50 knots during the period when racing would have been taking place. Safety considerations had to come first, particularly at this time of the year. All of us who sail small boats know that the best way to steer the boat is to use the shape of the hull, not the rudder, right? Heel to windward to bear away; heel to leeward to head up. The rudder is a brake. Sure. We all know it, but do we use that knowledge all the time? I found out while spending a week in a Laser class under the guidance of an excellent instructor at Minorca Sailing in October that I have some issues in this area. I thought I was using heel to help steer the boat all of the time but Ian Coppenhall (a.k.a. Comet), the instructor, helped me identify three situations in which I was not heeling to windward when I wanted to bear away. Windward Mark. The camera does not lie. And when our class was captured on video executing windward mark roundings it was obvious that I was sailing around the mark with the boat totally flat and using only the rudder to make the boat turn. Slow, slow, slow. Must remember to move my weight back and out to heel the boat to windward and use minimum amount of rudder. Starts. The day that Ian taught the class about racing starts, his talk covered pretty standard stuff. Favored end. Transit. Hole to leeward. Yeah, yeah. I know all that. So I asked him for some more detailed information on exactly what he did in the final 30 seconds before the start. His answer was every bit as detailed as I had hoped. Blow by blow, every move he makes, second by second. But what was that? At seven seconds before the start, he said, he heels to windward to bear away into that nice gap to leeward that he has created for himself. Ahah. There it is again. I'm sure I don't do that. I bear away using the rudder and if I don't have steerage I scull frantically (and probably illegally). Must remember that. Heel to windward to bear away just before the start. Heavy Air Gybes. The Tuesday afternoon of our first week in Menorca was wild. It was blowing 25 to 30 knots with gusts around 35 and I was psyched up to race in those conditions. I headed out in my Laser to the start area and played around in the waves for a while, waiting for the other boats to come out. Some of the other sailors seemed to be having trouble keeping their masts pointing at the sky long enough to sail more than 100 yards from the beach. After about twenty minutes it was obvious that most folk wouldn't be able to race in these conditions and an instructor passing by in a RIB confirmed my assumption that the usual afternoon racing had been cancelled. "Is it OK if I stay out and play?" "Sure. Just stay up this end of the bay." So I started blasting around and riding the waves. After a while Ian came out in a RIB and followed along behind me. Gave me some tips on how best to catch the waves. So I thought I would show off and practice some gybes. Bore away to a run in a huge gust and tried to complete the gybe. Couldn't get the boat to bear away any further and somehow managed to broach and capsize. After I had recovered and caught my breath, Ian explained what I had done wrong. Of course. Have to heel that baby to windward if you want it to turn in these conditions. Normally I do roll the boat into a gybe but I guess it was sheer terror and cowardice (born from way too many death rolls over the last 25 years) that had frozen my brain in the stronger winds. So I've been spending some time in practice sessions, in Menorca and since returning home, to try and break my old habits and create new ones. On windy days doing lots of gybes, with windward heel. In any conditions doing simulated starts and windward mark roundings, using windward heel. I do get it right in practice now. Just have to remember to do it right in actual races too. Second Life sure ain't like heroin as I first suspected. It's a bit more like broccoli. Yes, I finally succumbed to the spin from Zephyr and Soulsailor and tried out Second Life a few times. Signed up, walked in, chose an avatar, adjusted my clothing, and then started exploring. Found I could fly and teleport to anywhere I wanted. Except that a lot of areas seem to be private and out-of-bounds but I guess that's true in the real world too. Found some weird museum and someone to show me around but she said the escalators were broken so we couldn't visit all the floors. Just like real technology. Then found some kind of club but when I tried to chat to some of the folk twitching around they just ignored me. One later sent me an email saying he was "afk" which I gather means he was away from the keyboard. So it seems that a lot of the avatars that look alive in Second Life aren't actually connected all of the time to people in the real world at all. Reminded me of the sixties. Started to explore the shoreline looking for boats. Found a marina with some cool yachts in it. But whenever I went on one of the yachts it said that only the owner could sail it. Wandered around but there was nobody there so I couldn't ask anyone if I could go and sail with them. Hmmm. Marina full of boats and nobody using them. Just like the real world. Found some other place by the shore. Some cool-looking waterfront properties and a beach bar. Came across a guy with an awfully familiar name but he said he was too busy to talk to me. OK. No problem dude. Or "np" as we second lifers say. Went back the next day and found a beach. Sat down and started chatting to someone on the beach but then got a message, something about the simulator I was in was shutting down. Guess it was some kind of technical problem. Life's a beach and then it dies. Next day I met a couple who owned a yacht. They took me for a sail. Almost immediately the yacht capsized just like a dinghy. I didn't know how to rescue or help the couple. So I flew back to their dock and sat in their hot tub and watched the yacht capsizing again and again. Weird. Wandered around some more but when I went back to the home of the yachtie couple there was no yacht and no people. Did they drown? Can you die in Second Life? If you die, do you move on to Third Life? So all in all it was a somewhat disappointing experience. It was like broccoli. Some folk say it's good for you and some folk think it's tasty but it just doesn't do anything for me. Maybe I'm missing the genetic mutation that makes broccoli taste delicious? Maybe I don't care. Don't think I will be going back to Second Life. Time to work on some real world stuff like talking to a real realtor about selling my real house in the real world so I can move real near to the real ocean and my real granddaughter, and then go for a real sail in a real boat on some real water in some real wind. Reality is way better than virtual broccoli. I hate broccoli. I was just looking at my compass - do you know which way is south? Hmmm - well the sun is there, so south is over there. Not quite. It's that way. Yeah - I always think that the mainland over there is due north. And that the river runs north-south, but it doesn't. So you use a compass for frostbite racing? Yeah I can never judge headers by looking at landmarks on the shore because they are different at different places on the beat. Hmmm - good point - maybe I should try using one too. Thanks for the tip. Will you hold my boat while I take the dollies? The tide's going out, right? OK so I don't need to take them too far up the beach. I see your deck is more grey than mine. What year is your boat? So how did you do in that race? Right. I think the tide favors that side. Yeah, but the wind looked stronger on the left. Does this race have a time limit? Wonder if we will finish on time? I'm not I'm just drifting in the current. Yeah look at my telltale. Light cassette tape and it's hanging straight down. Hey, is that a ripple? We just crossed a current line. So what does that mean. Is the current stronger now? Meaning it's moving us more to the right? Sorry about that incident. I did my circle and recrossed the finish line. I should know by now it's a stupid move to finish on port tack on a short line in a crowded fleet at the port end of the line when the committee boat is there. I did it once last year too. Should have learned my lesson. Duh. Stupid move, I had nowhere to go. Yeah. I had nowhere to go either. Couldn't avoid you. That's OK. It was my fault. You had a good day today. Yeah - got a new sail - seemed to make the difference. Maybe it's time I got a new sail too. How often do you change them? Give a couple away when I sell an old boat. Hmmm. Maybe I should change my sail - it's had two years of good use. Actually I think I need a new boat. Hey, why are you taking your boat home? Don't you know there is racing next week? Yeah. I'm taking it home to get some practice in on a lake near my home. Went down to the reservoir yesterday. I went for a blast in my Laser anyway. I was "suddenly immersed in cold water"
"We don't stop sailing because we get old. We get old because we stop sailing." Couldn't have put it better to myself. The quote is by a 75-year-old, Bas Messenger, who has just started sailing a Streaker. Full story at Yachts and Yachting. Thanks to everyone who replied to my post Commitment Questions which contrasted training for running and for sailing events, and raised some questions on how to prepare for a major sailing championship. Dan Kim from Adrift at Sea offered some observations on the differences between running and sailing and Orion told us about his experience in combining the two sports. Kin wisely commented, "Maybe it's important that in sailing one has to think, and it is how well you sail, not where you finish," and Matt, also a sailor and a runner, advised, "Train hard, believe in yourself, and you will know that however you finish in either event, you prepared as well as you could have given resources and time." Thanks to both of you for the words of support. More detailed advice was provided by two other Laser Master sailors: Vann who talked about his preparation for the 2005 Masters Worlds in Brazil, and Ari who hatched a unique plan to prepare for the first Masters Worlds after he turns 45. 1. Sailed late afternoons four days a week for nearly a year. I gather that Vann is based on the west coast of the USA. It's tougher where I live with its more extreme winters to follow such a program through the winter. Not exactly easy to sail when the water is solid. Just means I will have to do even more sailing when the water is liquid to keep up with guys like Vann. 2. Attended a few high quality regattas but planned on more practice than regattas. Also my plan. Depending on when the Masters Worlds are held (currently uncertain) I ought to be able to sail the Laser North Americans (Hyannis - June) and Canadian Championship (Ontario - also June). 3. Also attended one three day laser clinic with two top notch coaches. I do have a clinic planned for early in 2007. 1. Sail some practice days in a venue that had the expected conditions. Hmmm, would love to do that but we don't know yet where the 2007 Masters Worlds will be. 3. Regardless of the goal it is good to spend some time in practice sailing with someone who you believe is above the level of the goal you have made for yourself. Good tip Vann. Need to work on setting that up. 4. Sail at least one big regatta that uses the trapezoid course. This type course requires a lot of buoys making it confusing. 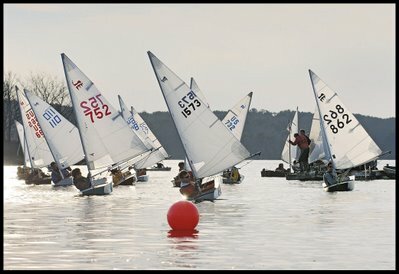 Adding to the confusion, there are often two races going on simultaneously using the same buoys; one group using an inner trap while the other uses an outer. He's so right. Even good sailors sometimes get lost on trapezoid courses. At the Masters Worlds in Mexico in 2000, several dozen sailors went the wrong way in the practice race. I've sailed a few regattas on these course in previous years and no doubt the major championships before the Worlds next summer will have trapezoid courses so I think I should be in good shape on this issue. 5. Finally, the most important thing is fitness. Yeah, yeah, I know. I have started a fitness program but I do need to ramp it up and get more serious. Hire an elite coach, buy 15 Lasers, open a Laser Training Center and persuade some of the best Laser Open competitors to come and train there. Wow. Now that's what I call creative! If you have any comment on these comments about my comments then please leave a comment in the comments section.